Popular reality show Bigg Boss season 11 is witnessing its weekend episodes these days when the host of the show, Salman Khan slams those contestants of the house whom he feel have done something wrong in the past week and in the last night's Weekend Ka Vaar episode of the show, the fans witnessed how Salman lashed out at Hina and Priyank for body-shaming Arshi Khan and Shilp Shinde. What happened was during a conversation that took place between Hina, Priyank and Luv Tyagi, Priyank called Arshi and Shilpa, fat and 'saand' and said that they could not even run and that is the reason they cannot become captains in the house. That is the reason why Salman Khan scolded Priyank and also Hina for supporting him by nit stopping him from saying so. Not only Salman, Hina has been receiving a lot of backlash on the social media for her double standards. Television actor Karan Patel of Yeh Hai Mohabbatein fame also took to his Twitter account to post something for the actress. In his tweets, he shared his views about the actress. Karan tweeted, "Woh jo mohotarma hai #BigBoss11 ke ghar mein jo baat baat mein #ThankYouGod aalaapti hai, jo aaj hajaam bani hai, koi unse pls pooch ke bataye ki #YehGhatiyapanKyaKehlataHai. #KitnaGandaKhelKhelogiMadam #Sick #Sadistic #Disgrace .. #BholiSuratGandiNeeyat ..! #FakeToTheSoul ." 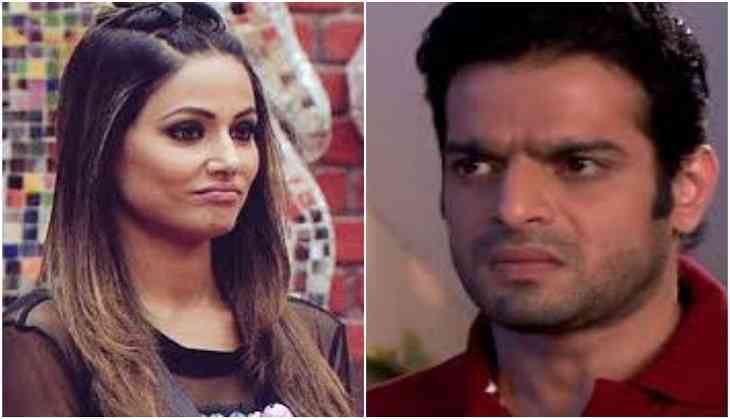 Rocky Jaiswal, who is Hina Khan's boyfriend came out in her support and also replied to Karan on twitter. He tweeted, "Nakli Ball se Box k andar cricket khel ke itna accha pradarshan? Imagine what will happen if he’s in @BiggBoss . Yeh loh yeh toh #AurKabaadHoGaya abb batao #YehGandhapaKyaKehlataHai Mr. #FaketotheSoul preach karne se pehle practice karna seekho #Sickman #BologeTohSunoge"
Karan, after Rocky's tweet did not stopped but provided him with evidence of the same where Hina can be seen avoiding Shilpa in the Bigg Boss house. He tweeted again and wrote, "See, the facts with visual evidence." In last night's episode, Salman and Hina also got into a fight with one another where Salman asked Hina to talk about what is happening in the present and not what had happened three weeks back.